Play Wu Shi Lion Slots & celebrate the Chinese New Year with 5-reels of far-east icons. Spin to get your golden fortune! 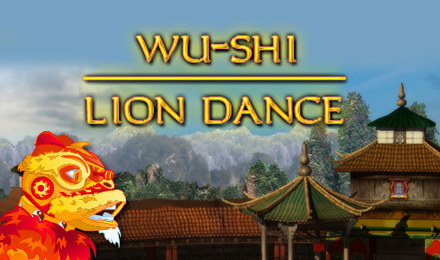 Wu Shi Lion Dance Slots plunges you into a Far-Eastern land packed full of Asian fantasy with the chance to win a real fortune. Graphics are lush and the atmosphere is extremely fitting for a Chinese-themed slot. In addition to this Wu Shi Lion Dance slots has got tons of fun bonus features and symbols making it even more enjoyable. There are three special symbols in this round. The Red Envelope symbol takes you to a multilevel bonus round and the Lion symbol kicks off the free spins. If you pick up three or more cracker symbols and you’ll activate the Fireworks Bonus. All these bonuses give you the potential to win big and their interactive feautres of this game makes it a top choice for slot game lovers. Wu Shi Lion Dance Slots is a 5-reel slot game with entertaining bonus rounds and tons of great features which make it highly enjoyable. The inclusion of three exciting bonus features helps set it apart from standard online slots and emphasizes its great playability.